This planning guide is designed to help IT managers plan their device upgrade strategy based on decisions that help manage costs and maximize user productivity. There’s a balance to be achieved between the direct costs associated with... upgrading and the overall value gained by increasing productivity with newer, more secure mobile devices. By understanding all the factors that contribute to total cost of ownership, you can develop a stronger business case for upgrading that moves beyond budget constraints to focus on value. You’ll also find out how the interactive Business Client Refresh ROI Estimator tool can help you evaluate the potential ROI of device refresh using your own organization’s unique data. 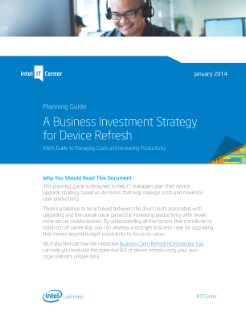 Read the full Business Investment Strategy for Device Refresh Planning Guide.